Left: Daytime (top) and nighttime (bottom) of the Lam Yuen Fong Optima sign at the Sincere Insurance building in 1958 on the border of Wanchai and Admiralty. 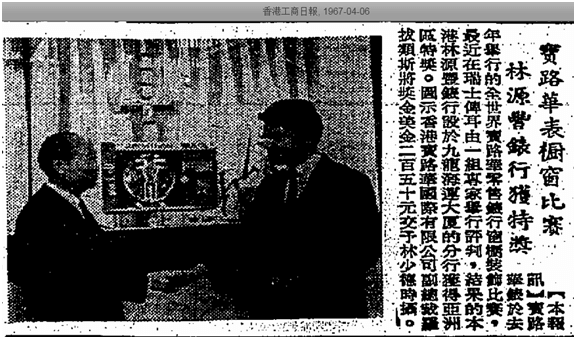 Lam Yuen Fong was the sole agent of Optima in HK. 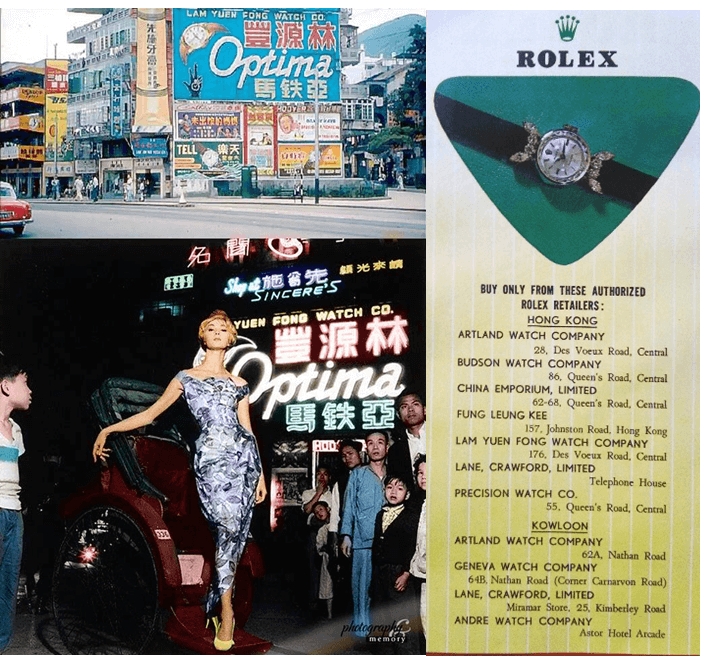 Right: Rolex ad in HK from the 1960s listing its select group of authorized retailers including Lam Yuen Fong. 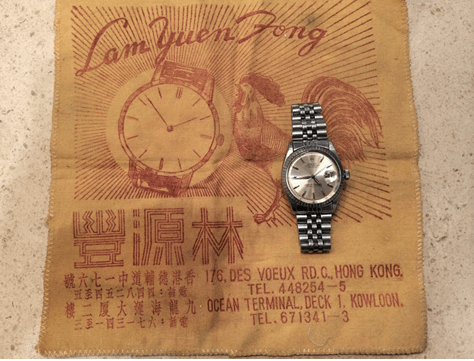 From the 1940s to the 1960s, Lam Yuen Fong Watch Co was the biggest name in the watch business in Hong Kong. In addition to stores in prime locations in Central and Tsim Sha Tsui, Lam Yuen Fong was the master distributor in the Far East for Swiss luxury watch brands such as Patek Philippe, DeLaneau and Optima. In fact, the firm’s founder Lam Hau-tak was regarded as the “King of Watches” in South China before 1949 as the firm also had branches in Swatow, Shanghai, Canton and Cham Kong and a watch factory in Swatow (South China Watch Factory) and the firm soared to new heights in HK under the management of his sons before exiting the watch business in the 1970s. Separate from Lam Yuen Fong, Lam Hau-tak’s widow Hung Wai-ching was a pioneering female industrialist as the proprietor of HK Handicraft Factory, a leading exporter of woolen garments. A native of Chaoyang in the Chiuchow region, Lam Hau-tak started out fixing watches on the streets of Swatow with a bag of tools on his back. Eventually he saved up enough to open his own watch shop in Swatow under the name of Lam Yuen Fong in the 1910s. From early on, Lam focused on the high-end market and built up a solid reputation over time as a leading retailer of imported luxury watches. Business expanded rather than contracted during the Japanese invasion and the Chinese Civil War in the 1930s and 1940s as luxury watches were viewed by wealthy families as valuable assets (some of which worth the price of a house) that could be easily transported and hidden. In April 1942, Lam Hau-tak opened the Canton branch of Lam Yuen Fong at 189 The Bund, a busy shopping district where major hotels, department stores and theatres were located. 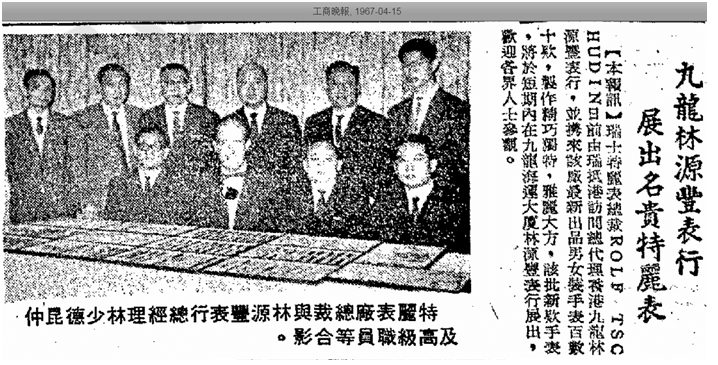 The manager of the Canton branch was Lam Hee-kang (林豈耕), who later established Shui Hwa Watch (瑞華表行), the sole agent of Piaget, Baume & Mercier and Corum watches in Hong Kong in the 1960s. H.T. Lam placed heavy emphasis on customer service, hiring the best watch repairmen in the business and English-speaking salesmen who were knowledgeable about watches. He also invested heavily in promotions, including installing large terrazzo flooring with watch designs outside the store. 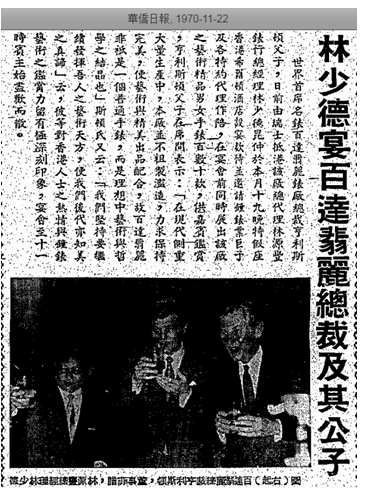 As a result, the Canton business was extremely successful with monthly revenues of HK$2-3 million (huge sum at the time) and counted high ranking KMT officials such as T.V. Soong and General Yu Han-mou, foreign diplomats such as the Soviet ambassador, warlords from the Northwest and their spouses as clients. After the War, the Lams moved to HK where they have set up shop at 176 Des Voeux Road Central in Sheung Wan. Chinese consumers have been obsessed with Swiss watches since the 18th century and in HK, J. Ullmann (to be covered) was a top Swiss watch brand from the 1860s through the 1930s whose eponymous Swiss founder started the firm in HK in 1860. In the early 20th century, top Swiss brands such as Rolex (founded 1905) and Omega (founded 1903) entered the Chinese market with the earlier doing so directly while the latter distributed through the trading house of Crobest (later renamed Omtis) owned by the Beraha family. According to the autobiography of Emperor Group founder Albert Yeung, the top Swiss brands were highly selective in who they distribute through to maintain their luxury image and Lam Yuen Fong was one of the few authorized retailers of Rolex in the 1950s and 1960s alongside Precision (金輪), Budson (弼臣), Artland (藝林) and Fung Leung Kee (馮良記) and the top department store Lane Crawford and its subsidiary China Emporium while upstarts at the time like Emperor and Oriental only could sell lesser brands. A 1960 ad list Lam Yuen Fong as agent for Omega, Tissot, Rolex, Tudor, Cyma, Mido, Movado, Longines, IWC, Girard-Perregaux, Universal, Glycine, Onsa and Optima. Outside of work, Lam Hau-tak was very active in community affairs in HK as evidenced by the fact that 12 different groups jointly organized memorial service in his honor after his death. In addition to being the founding chairman of the Federation of HK Watch Trades & Industries in 1947, Lam was chairman of HK’s leading Chinese charitable organization Tung Wah Group of Hospitals in 1948 and one of seven candidates running for the chairmanship of the Chinese General Chamber of Commerce in 1947. He was chairman of Lam Sai Ho Tong (the family association for the Lam clan) and permanent honorary director of the Chiuchow Chamber of Commerce. He also sponsored Hong Kong Academy (香江學院), a school founded by Seaker Chan and others which later merged with other schools in 1956 to form United College and was one of the leaders in the pre-1949 effort to build a university in Chiu Chow. By the early 1950s, H.T. Lam was in poor health due to his heart condition and in 1952, his principal wife (last name Yiu) died. He himself died in 1954 at his Broadwood Road residence at the age of 58 and left an estate of over HK$1.7 million (which was an enormous sum back then) to his three sons. Lam Hau-tak’s wife Hung Wai-ching received her nursing and medical training in Canton and Swatow. After her husband’s death in 1954, she was not involved with the family watch business but instead incorporated Hong Kong Handicraft Factory (香港手工製造廠) in 1955 to manufacture woolen knitwear such as cardigans and pullovers and woolen and nylon gloves for exports to markets such as the United States. Its offices were located at Pedder Building in Central while its factory was located at 10 Western Industrial Section of Tung Tau Tsun Road in Kowloon City. Outside of work, Hung was very involved with the Lock Tao Christian Association (基督敎樂道會), a HK Chiuchow Christian group formed in 1947. 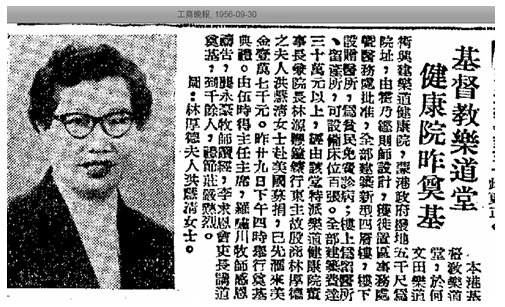 She led the group’s effort in building 4 schools in TST, Hunghom, Kowloon City and Homantin in the 1950s (only the Homantin school survived and became an English secondary school and has since relocated to Shatin) and contributed US$17000 to the building of the 4 story Lock Tao Nursing Home in Homantin which was opened by Governor Grantham in 1957 and served as its first director contributing her medical skills. She was also the chair of the Sun Po Kong and Lok Fu Kaifong Welfare Association, the Wong Tai Sin District Industrial & Commercial Association (黃大仙區工商業總會) and the HK & Kowloon Women’s Athletics Association (港九女子體育會) and head of the women’s department of Lam Sai Ho Tong. HK Handicraft Factory was dissolved in 2002. Lam Hau-tak was survived by 5 sons (in order of birth) – Andrew Lam Siu-tak, Lam Sui-pong (林瑞邦), Lam Sui-kwok (林瑞國), Lam Wing-tak (林榮德, also known as Lam Sui-ting 林瑞定, graduated from the Queen Elizabeth School and went to the UK for further studies in 1957) and Lam Sui-kwong (林瑞光). As the eldest son, Andrew was groomed to take over the family business at an early age and was sent to the Neuchatel canton in Switzerland to study watchmaking in 1947 – first at the Omega factory in La Chaud des Fonds and later at Le Lochle where the Tissot watches were made in the early 1950s. 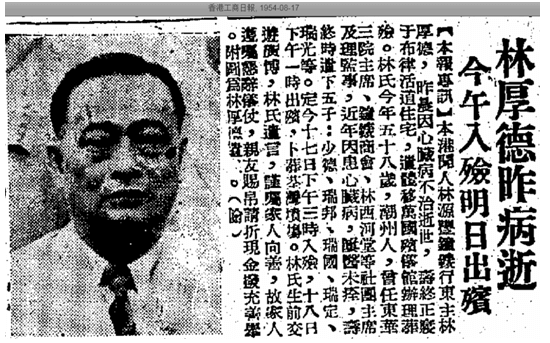 Upon his father’s death in 1954, he took over the management of Lam Yuen Fong and also inherited some of his father’s social positions such as director of Tung Wah (1967) and chairman of Lam Sai Ho Tong (1966). The watch business in HK took off in the late 1950s and 1960s as Japanese and American tourists began to flock to the British colony. Under the leadership of Andrew Lam, Lam Yuen Fong established a Kowloon branch in the newly opened Ocean Terminal in 1966 and secured the master distributorship of several leading Swiss brands – the most important of which being Patek Philippe (百達翡麗), which was founded in 1851 in Geneva and has been owned by the Stern family since 1932 which the Lams were close to. For whatever reason, the Lam family decided to exit the watch business in the 1970s. (A “Lam Yuen Fong Watch Co and Land Development Ltd” was incorporated in 1973 and dissolved in 1995) The distributorship of Patek Philippe was transferred to Fairfield Enterprises, which was founded by Boston-born Jewish merchant Harry Morgan Weinrebe (1914-2000) as Weinrebe & Pennell in 1959. A violinist, Weinrebe led the formation of the HK Conservatory of Music which was merged into the HK Academy for Performing Arts and was a major patron of music in HK, UK, Switzerland and Israel. After Fairfield was dissolved in 1998, Libertas Ltd has been the distributor of Patek Philippe in HK. This article was first posted on 20th July 2018.